Hannah Bostick is a biochemistry major with a pre-vet concentration. She works as an undergraduate research scholar studying Bovine herpesvirus 1. 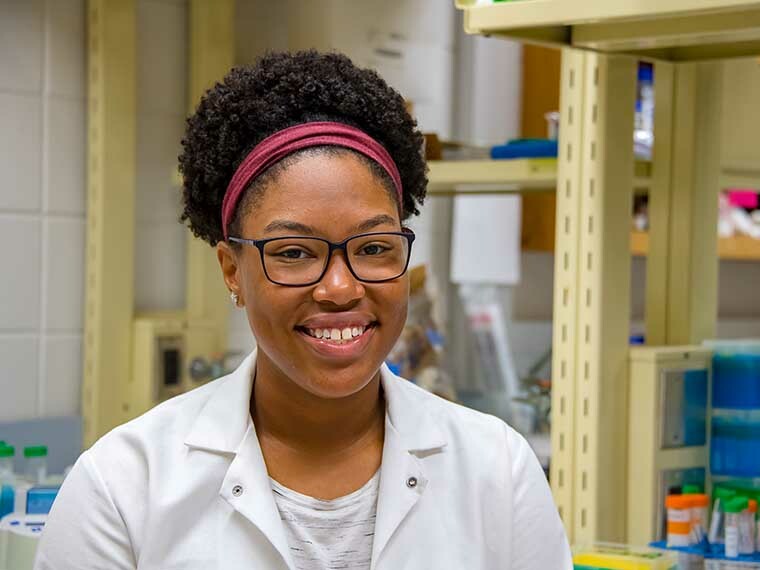 The Birmingham, Alabama native plans to continue her education in vet school after she graduates. Her undergraduate research scholar program is under the supervision of Dr. Florencia Meyer, associate professor and MAFES scientist in biochemistry, molecular biology, entomology and plant pathology. Her work involves the characterization of genes in the virus, Bovine herpesvirus 1, via polymerase chain reaction (or PCR). Bovine herpesvirus 1 is a major cause of bovine respiratory disease, which costs the cattle industry one billion dollars a year in production loss. Bostick analyzes how certain genes encoded in the DNA of the virus are expressed, which ultimately leads to the production of a viral protein. She says the team is trying to determine exactly when these genes begin to express after the initial onset of infection. “The important step is when the protein is made, because the protein carries out the function for the virus,” she explained. Bostick said the team seeks to identify new viral genes and proteins in order to identify an essential function and figure out how to prevent new infections. Besides being a fulltime student and undergraduate research scholar, Bostick is also a squad leader and first chair in the marching band and plays in the concert band wind ensemble. She is the vice president of the MSU chapter of Gamma Beta Phi, a national honor and service society, and works as an information assistant at the front desk for a campus dormitory.